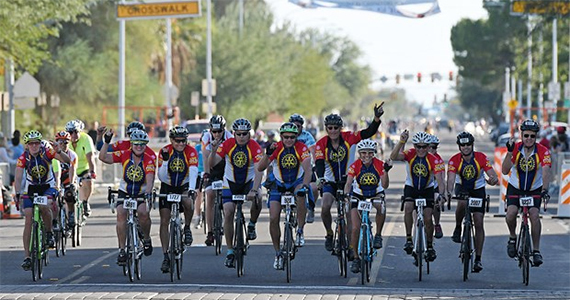 Rotarians participate in the El Tour de Tucson in Arizona, USA, in 2016. Roughly 10 years ago, Rotarian Michael J. Harris of the Casas Adobes Rotary was debating ways to help small Rotary clubs take advantage of the Bill & Melinda Gates Foundation’s 2:1 match for contributions to PolioPlus. For some time, Mike had also lobbied Perimeter Bicycling to allow Rotary to field a team in El Tour de Tucson as one of the ride’s “beneficiaries.” He thought that would be a great opportunity for clubs large or small. Mike could not have imagined what his pet project would become. Or, knowing Mike, maybe he could. Mike left us in 2011—way too early, and too soon to see his dream bear fruit. Ten years ago a loose association of Rotarians fielded a team that rode in El Tour and raised about $10,000, or $30,000 if you include the Gates match. Fast forward to November 2018. Eighty-five cyclists came to Tucson from as far away as France and Australia to Ride to End Polio and teams from as far away as Mongolia participated on stationary bikes in homes and gyms around the world. All told the 2018 participants raised $5,732,550 including the match. Cumulatively since Mike birthed the concept the ride has raised over $53.3 million. It is hard to know the impact of the ride, but it is safe to say there are a lot of children walking around today that need not fear this terrible disease as a result of what the district has achieved. During the past decade the Ride to End Polio has gained in popularity and notoriety. Since 2012, Rotary’s General Secretary John Hewko has participated in the ride and his global reach supercharged our fundraising. In fact, in a tribute to his fundraising success, the 2013 El Tour de Tucson named John as the Dedication Recipient. Cyclists have joined us in Tucson from the Philippines, Germany, Canada, France, Brazil and Australia and from a dozen states. The Harris Trophy contains names of the most successful fundraisers. Several years ago Darrell Stewart and Chris Harris collaborated to produce what is known as “the Harris Trophy.” Each year the most successful fundraisers’ names are engraved on the trophy, which sits just outside the office of the General Secretary at Rotary headquarters in Evanston, Illinois. The Ride to End Polio is nothing without the many volunteers that contribute to the effort. A volunteer committee plans and manages the ride each year. The Marana Rotary coordinates the aid station that serves thousands of cyclists looking for a drink, a snack or someone to hold their bike while they take a quick break. Other volunteers staff a booth at the El Tour finish line providing food, drink, massage, and a seat in the shade for weary cyclists. Most agree that the Ride to End Polio has evolved into one of the most successful single fund-raising events in the history of Rotary. While we cannot make that claim with certainty, what is certain is that District 5500 and the Ride to End Polio have made an enormous contribution to the eradication of polio and to the elimination of suffering in the world.